Those who know me know I love house and studio museums. I believe the spirit of the artist comes through in the places they were. And I love museums dedicated to one artist. Especially when they then have solo shows of other artists. The building above, in downtown Chicago, should house one but doesn’t. It’s a perfect location, a block from the tourist-frequented John Hancock building, and across Pearson Street from the Museum of Contemporary Art. If you don’t know who lived there, I’ll tell you in a second. But first, I digress. In Paris I loved the Bourdelle Museum. No, it’s not the bordello museum ya numbskull! It shows the sculpture of Antoine Bourdelle. I love the garden there, there used to be nobody around. Zadkine has a nice house and studio museum in Paris too. These places make city life richer. And history come alive. 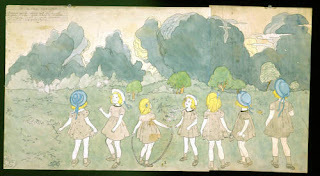 Henry Darger lived, for more than 40 years, until about 1973. It would have been a special house museum and a great attraction for visitors. I believe the space contained secrets. There he wrote and illustrated his 19,000 page long book, ‘The Story of the Vivian Girls, in what is Known as the Realms of the Unreal, of the Glandeco-Angelinian War Storm, Caused by the Child Slave Rebellion.’ Is Darger’s America’s Van Gogh? He is a fine colorist. And then there is the place above. A space we know was inhabited by a great artist, an original thinker. There he lived for nearly thirty years. In a few rooms in 200 East Pearson, on the corner of Pearson, and — yes, we have done it – Mies van der Rohe way. (I love to hear the bus drivers pronounce it, and I’ve yet to meet one who knows who Mies was.) I’d love to see it turned into a Ludwig Mies van der Rohe House Museum one day. When the currrent owner (a fine architect) wills it. As I said it’s right across the street from Chicago’s Museum of Contemporary Art (although a great old armory sat there when Mies lived on Pearson) and they could administer it. Wouldn’t a Mies museum across the street draw more people also to the MCA? Inside the Mies House let’s display objects he designed, and some of the things he owned. Plus printed matter and a room of videos of him and of others explaining his work and his influence. And from this very central location in Chicago, right near 860 – 880 Lake Shore Drive, 900 – 910 Lake Shore Drive, and the Arts Club staircase, launch Mies tours including to IIT and the Farnsworth House. Serve martinis if you like ! In 1941 Mies moved his residence from a Chicago hotel to 200 East Pearson Street, Chicago, IL, USA, where he lived until his death in 1969. Other than painting the walls white, the only change he made in the apartment was to built two wall shelves cantilevered on both sides of a gypsum block wall that separated the living room from a bedroom. You are currently browsing the archives for the Bourdelle category.